HIMSS16 will be jam-packed with cutting-edge technologies in mHealth, Digital Health, Connected Devices, Wearables, IoT, and more. It’s only at iVEDiX booth #12433 that you’ll find our unique mobile and digital thought leadership, presentations, interactive tablet bar, and fantastic giveaway prizes. Here you can play with the future of healthcare, and learn how it can become a reality for your organization. If you and your organization are committed to providing the best care, the clearest insights, and the most decisive action from your data, we highly encourage you to visit booth #12433 during HIMSS16, or schedule a meeting now. 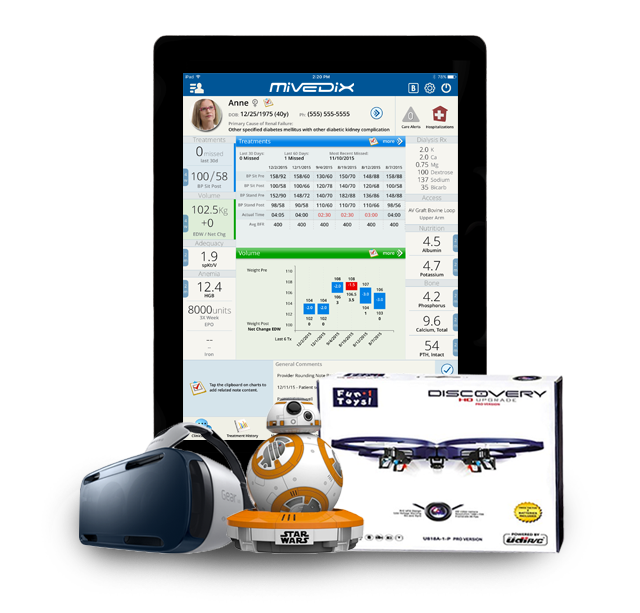 The iVEDiX booth features the mobile workflow and analytic solutions of miVEDiX. With interactive presentations and demos, miVEDiX creates a digital experience for clinicians and administrators alike. Around the world, clients are talking about their success: improving patient care, optimizing workflows, and health monitoring. See for yourself during HIMSS16 at booth #12433, and enter for a chance to win one the awesome prizes above.